Wow--a tough read, and you'll need a box of tissue. Yet, in the end, it's a stunning picture of God's faithfulness. My mother-in-law shared this book with me and I wasn't sure if I'd want to read it. I read it in one evening. My husband kept looking at my red, splotchy face and asking why I wouldn't just put it down. But, even through the sorrow, there was beauty. One small thing that stood out to me, yet spoke so loudly, was that even in the physical printing of this book, nothing stayed the same after the tragedy that took Maria Sue. Nothing could. The Chapman's are still in the process of healing, and writing this book is a part of that. Mary Beth is honest in her struggle of faith, yet holding tightly to it. Choosing to See will challenge you, it will touch your heart, pull out your tears, and leave you with a beautiful picture of God standing in the midst of even your darkest hour ~ you just have to choose to see Him. This looks great. I'll have to put it on my TBR pile. It looks like a tear jerker just from the cover! 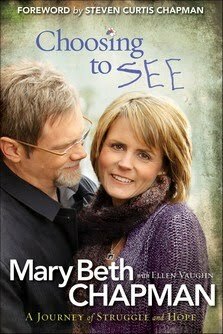 I loved Mary Beth's honesty in this book. How she struggles yet still holds tight to her faith in God. I think women with real struggles will be blessed by it.